Perennial. Zone 2. Myrsinaceae, formerly Primulaceae. A.k.a. 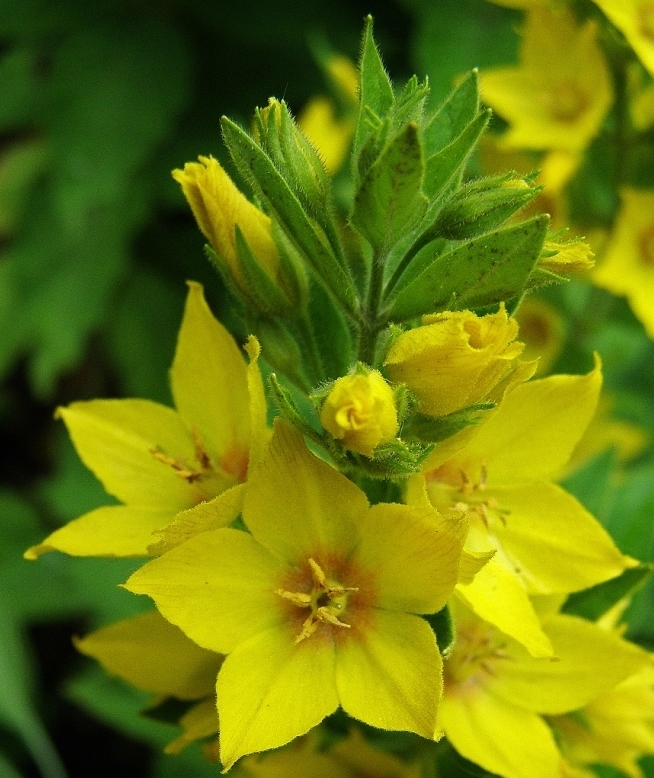 YELLOW LOOSESTRIFE, GOLDEN STARFLOWER. Austria, Italy, and east to Turkey. This rather romping species is native to Europe, and has been grown in gardens for centuries. It was thought to have medicinal properties, being used as a wound herb to stop bleeding, and also to repel insects. Now we grow it strictly for ornament, for its adaptability and the summer beauty of its bright yellow star flowers. Looking at the vivid yellow, unmarked flowers, you may wonder why Dotted Loosestrife is a common name, but if you look very closely at the undersides of the leave, you will see the tiny dark oil glands which led to Linnaeus choosing punctata – in Latin, “a point” – as its specific designation. This plant is quite a tidy clump former its first few years, but keep an eye on it, as it will suddenly decide it needs more ground and it will expand outwards in all directions, though not by runners, merely by shouldering aside less robust neighbours. 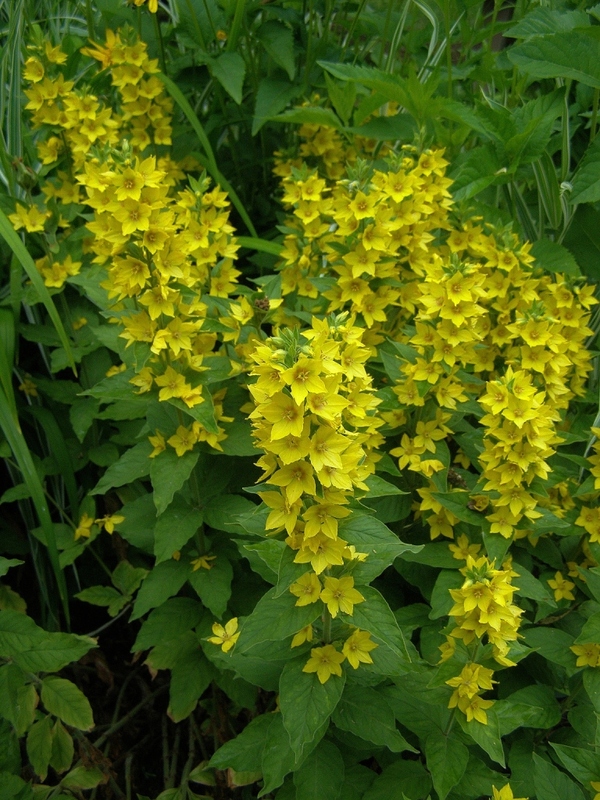 Lysimachia punctata is a well-respected garden plant, but it is not exactly what one would call shy, so you will want to site it appropriately. 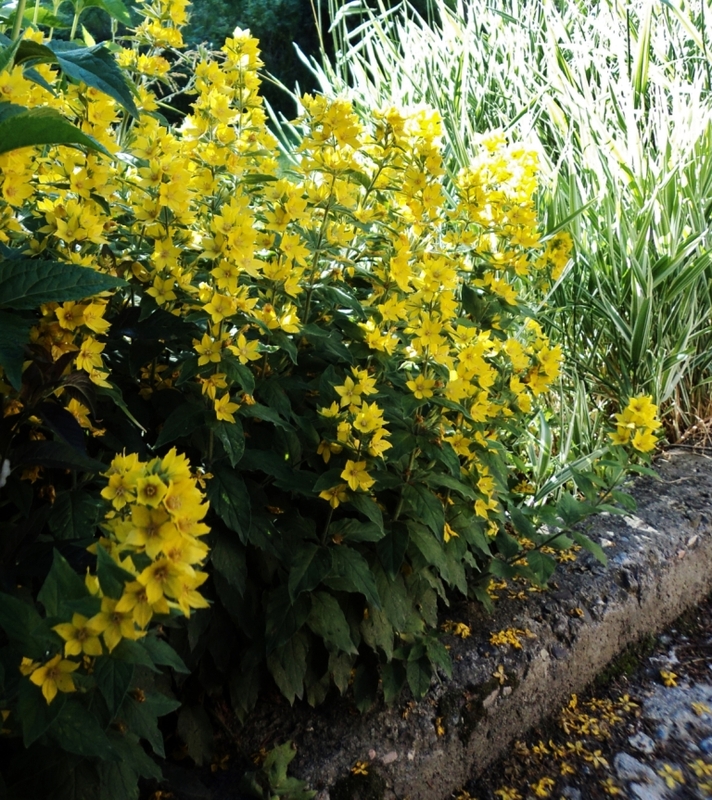 Though Dotted Loosestrife is decidedly a moisture lover, I have had great success with it in a rather dry, neglected bed. It shares its space with a huge clump of ribbon grass (Phalaris arundinacea picta), ‘Europa’ tawny daylily (Hemerocallis flava), and a perennial sunflower, Heliopsis helianthoides, all of which are equally vigorous and have reached a kind of boundary stalemate. This combination has been working nicely for over ten years, though I do occasionally steal a few divisions to put elsewhere or to sell. I did initially grow it in a moist, fertile, newly prepared bed, but it was much too happy there and overran some more delicately precious plants, hence its relative exile to its present location. Lysimachia punctata grows to about 2 feet tall and wide in its present place; I suspect it would be even taller with more care. It’s a beautiful plant when in bloom, and something I particularly enjoy is its habit of shedding spent flowers like a cloud of star-shaped confetti all over the ground. It blooms for weeks and weeks, mid June right through July and into August most years, and even after flowering the foliage stays handsome, though a few leaves will brown a bit. It is also an excellent cutflower, though it does shed flowers from the bottom up. 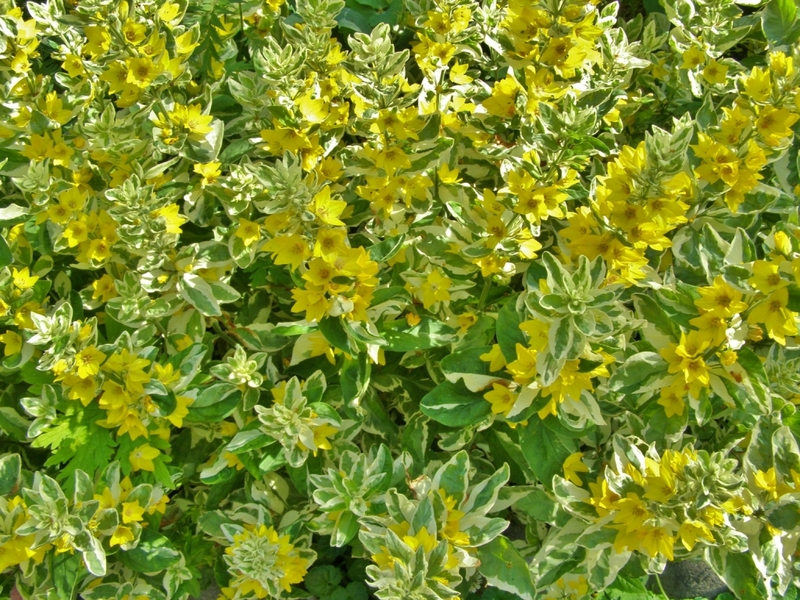 There are two variegated varieties which are now in cultivation, both developed from spontaneous colour breaks in plantings of Lysimachia punctata in England. The first is a white-edged sport called ‘Alexander’, or sometimes ‘Alexander’s’, named after the late husband of its discoverer, Pauline Alexander. First identified in 1990, the plant was patented in 1998, after nursery trials proved its colour stability and growth trait predictability. ‘Alexander’ is much slower growing than its mother species, and needs a bit of nurturing and a good moist soil at least the first few years. It has extremely appealing pink-blushed emerging growth in spring, very exotic! If this cultivar has a fault it is that the variegation causes puckering along much of the foliage; “purse-stringing”, as it is called. This puckering looks rather like disease or insect damage at first glance, and may be worrisome if you’re not aware that this is a varietal characteristic. Whatever genetic mutation was at work was not quite finished yet, for in 1998 another colour break was observed, this time in a test planting of ‘Alexander’ at Walburton Nursery in England. The leaf edges were golden, instead of white, and without the drawstring puckering which marked ‘Alexander’. ‘Golden Alexander’ was separated out, reproduced, and patented as a separate variety in 2003. Both ‘Alexander’ and ‘Golden Alexander’ are hardy and suitable for the Cariboo-Chilcotin. They are not as vigorous as the green-leafed species, and require some care to ensure they reach full potential, but their bright colour is very appealing and they are worth growing for their strong curiousity value. Something to watch out for in both of these cultivars is their strong tendency to revert to their all-green state. Vigilantly nip out any green shoots appearing in your colony, as these will quickly take over if allowed to remain. 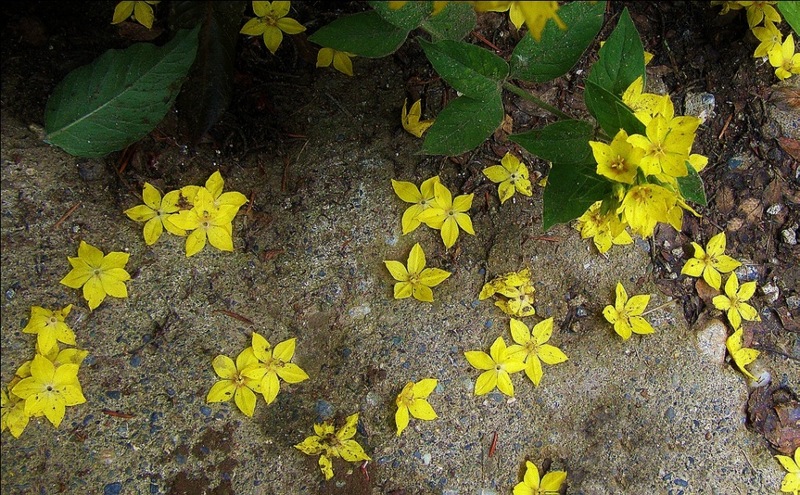 Lysimachia punctata in all its colour variations thrives in full sun to part shade. It can happily be grown very moist, but accepts drier conditions with aplomb. It appreciates average garden soil – don’t grow it too rich. In general, a tough and trouble free species.